Karl Benjamin's reputation preceded him as one of the four Los Angeles-based Abstract Classicists. For many who knew him closely he was regarded as a kind and generous person and a great painter. In an art world that all too often brims with attitude, Karl was a man greatly admired for his serious and dedicated approach to painting, his investment in those he chose to mentor and for being a truly kind soul. 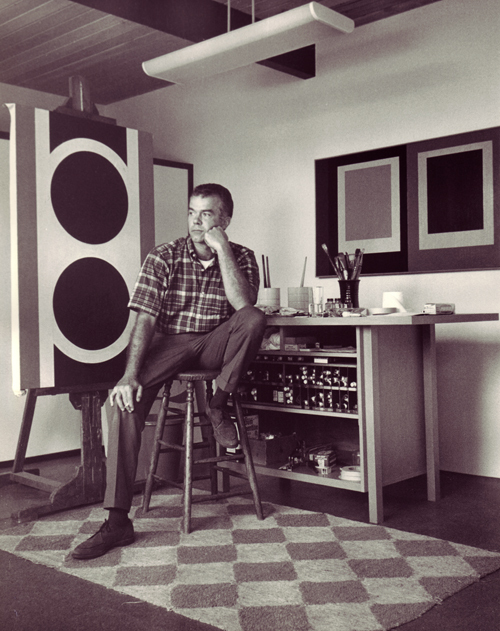 Karl Benjamin in his studio, 1964. By the time I was ten years old I knew that I would be an artist. My family moved to Claremont, California when I was twelve. I was earnestly painting still lifes I'd set up on the kitchen counter and landscapes of Mt. Baldy that I could see from my backyard. In the village of Claremont there was a shop at that time, a hippie shop, called Tsia that still exists in some other incarnation today. One day I saw this magnificent thing hanging in the window of Tsia. It was like something I'd never seen. It was a painting but it didn't feature anything representational, no mountains or flowers or even an object, just colors, patterns and shapes but it still looked like a painting-- it hung on the wall and was a square. It was a Karl Benjamin painting. My mind was blown wide open. I thought, you mean it's possible to make a painting that looked like that. I was thirteen years old at the time and it changed my mind forever about what was possible in painting. So began my long love affair with Karl's work and as I got to be much older I came to recognize who he was, his importance in the art world, in the history of painting and what a kind and encouraging person he was to me and others. A beautifully written, in-depth piece by Suzanne Muchnic appeared in the LA Times on the day that Karl Benjamin died at age 86. The Estate of Karl Benjamin is handled by Louis Stern Fine Arts, in West Hollywood, California.